Gyrolab® technology delivers high-quality immunoassay data with broad dynamic ranges that enables you to save time (assay time and manual, hands-on time), sample and reagents. Using an affinity flow-through format, Gyrolab technology simplifies assay workflows by eliminating incubations and shortening run times. 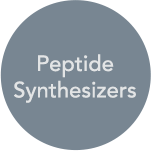 It starts with our proprietary CD technology engineered with highly reproducible nanoliter microfluidics integrated with Gyrolab platforms, which automate immunoassays with parallel processing using laser-induced fluorescence detection. This is possible through precise, automated control of centrifugal and capillary forces which steer liquid flow through nanoliter-scale microfluidic structures contained within the CD in which the assay workflow is automated. Gyrolab technology reproducibly measures concentration over a broad dynamic range, minimizing time- consuming and error-producing sample dilutions, greatly reducing assay repeats often associated with conventional methods. 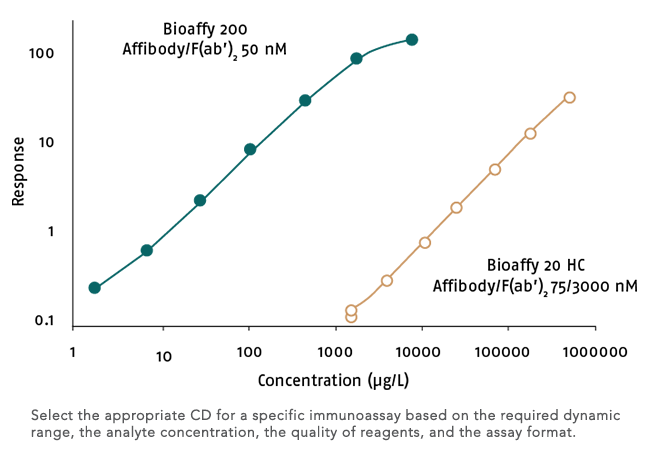 The broad dynamic range offered by our range of Gyrolab Bioaffy™ CDs enables antibody concentrations to be precisely measured from initial lab scale through to production. 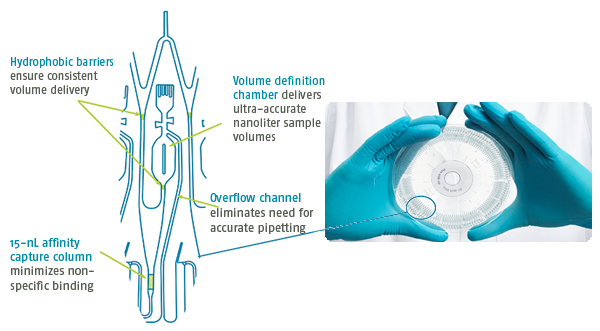 Running affinity flow-through assays at nanoliter-scale means short incubation times and minimal matrix effects. There is little need for sample pretreatment, and assays can be run in a broad range of matrices, including serum, plasma, synovial fluid, tears, urine, whole blood, sputum, vitreous humor, CSF and cell culture supernatant. 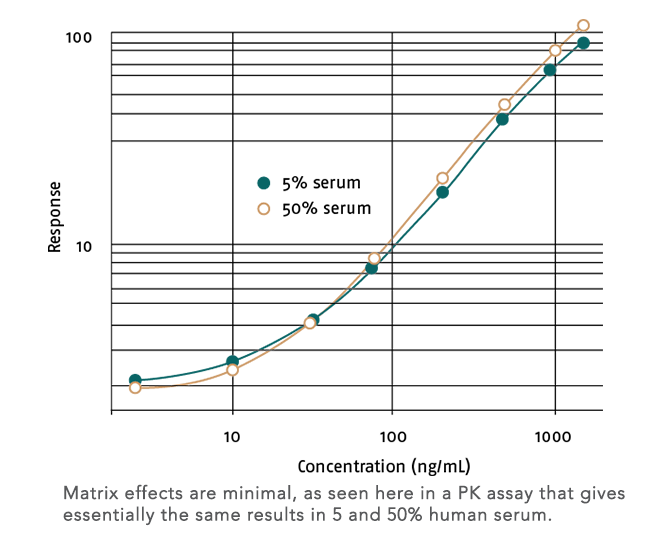 Matrix effects are minimal — as seen to the right in a PK assay that gives essentially the same results in 5% and 50% human serum. Move your assay from conventional ELISA to Gyrolab platforms with confidence. 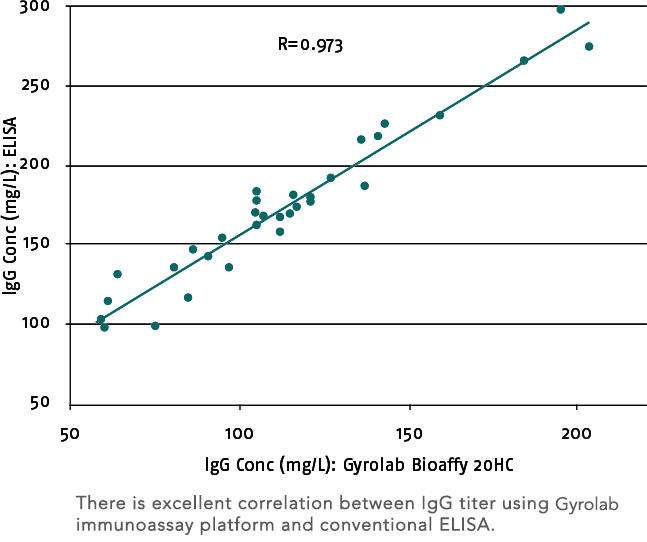 There is excellent correlation between IgG titer using Gyrolab immunoassay platform and conventional ELISA. Gyrolab assays can be developed in a variety of matrices, including serum or plasma, sputum, CSF and cell culture supernatant. Furthermore, you have full flexibility in choosing an assay format – such as standard sandwich, indirect and bridging. Develop assays using your own reagents or use off-the-shelf kits from Gyros Protein Technologies. Whether you need to accelerate assay development for preclinical R&D, facilitate upstream and downstream bioprocessing, meet critical data and time requirements for regulated bioanalysis or strengthen quality control in manufacturing, Gyrolab technology will put a new spin on what’s possible in your laboratory.